I’m Designer, Author, Radio show host Pat Sloan. We are jumping out of winter in my part of the world and I couldn’t be happier! Our March Designer is Christa Watson of Christa Quilts! Christa is an Author, Teacher, Shop owner, Designer, and Aurifil thread lover for many years. She has a passion for quilting, which she shares at her website and Facebook group via sew alongs and tutorials. She is always sharing something great! Let’s get to know Christa! I live in Las Vegas and my favorite spot is hanging out in the pool or at the water park with my kids. My first quilt sighting was a church charity quilt back in 1994. I was invited to help tie a quilt and it was love at first stitch! It inspired me to start quilting right away and the first quilt I ever made was flannel squares tied together with yarn. I made it for my (then-newlywed) husband Jason, and he’s still my number one fan to this day. As you can see from the photo – I’ve come a loooong way since then! I used to be an accountant but it was never my passion. I wanted to be an artist when I was younger, and always dreamed of owning my own business. When I realized I could do both by creating a career in quilting, it was a perfect match! Jason quit his job about 9 years ago to join me in our business full-time. He manages The Precut Store so I can do the fun stuff – designing, teaching and making. Our kids all work for us too, so quilting really is a family affair in our household. Last summer we took a family trip to Hawaii as a thank you to our kids for their hard work in helping us to run a successful business! Reading an issue of American and Patchwork and Quilting (June 2012) literally changed my quilting life. It was the first time I saw a modern quilt and I fell head over heals for this aesthetic. After 20 years of searching for my true quilting style, I had finally found it! I quickly researched more about the movement, bought books on the subject, made my first modern quilt, and entered it into the first QuiltCon in 2013. Soon after, I launched my design career and it’s been one inspiring moment after another! I have a large open loft that used to be the kids’ play room. As they got older, and their toys got smaller, I took over more of the space. It has plenty of room for cutting, basting, and quilting, plus there’s a large wall that doubles as my design wall and photography studio. However, I need to update the furniture to something more stylish. Fortunately there’s an IKEA opening up in my town this summer – I can’t wait to do a sewing room makeover! I love teaching others to machine quilt on their home sewing machines and my best tip is to give yourself lots of practice time. Many people expect their quilting to be perfect right off the bat and don’t realize that developing “quilting penmanship” takes time. Also, use a large drop-in table if you can, and add an extra small table to your setup to catch the weight of the quilt as you work. I love the 50 weight cottons because I can use them for both piecing and machine quilting. My favorite colors are Aluminium (#2516) Marrakesh (#3817) and Very Dark Gray (#4241). Aluminium is the perfect neutral for piecing light to medium color fabrics. I love Marrakesh when machine quilting a quilt with lots of bright colors – it goes with anything. Finally, Very Dark Gray is a great alternative to black. It shows up better than black when quilting on black fabric and it’s great to use for piecing very dark fabrics together. I recently released my first book, Machine Quilting With Style, and my second book is coming out in April. I co-authored The Ultimate Guide to Machine Quilting with another fabulous Aurifil designer, Angela Walters. Most of the quilts in both books were pieced and quilted with Aurifil thread! 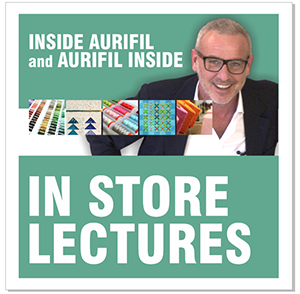 I’m also thrilled to be returning to the QuiltCon faculty next February in Savannah, Georgia. 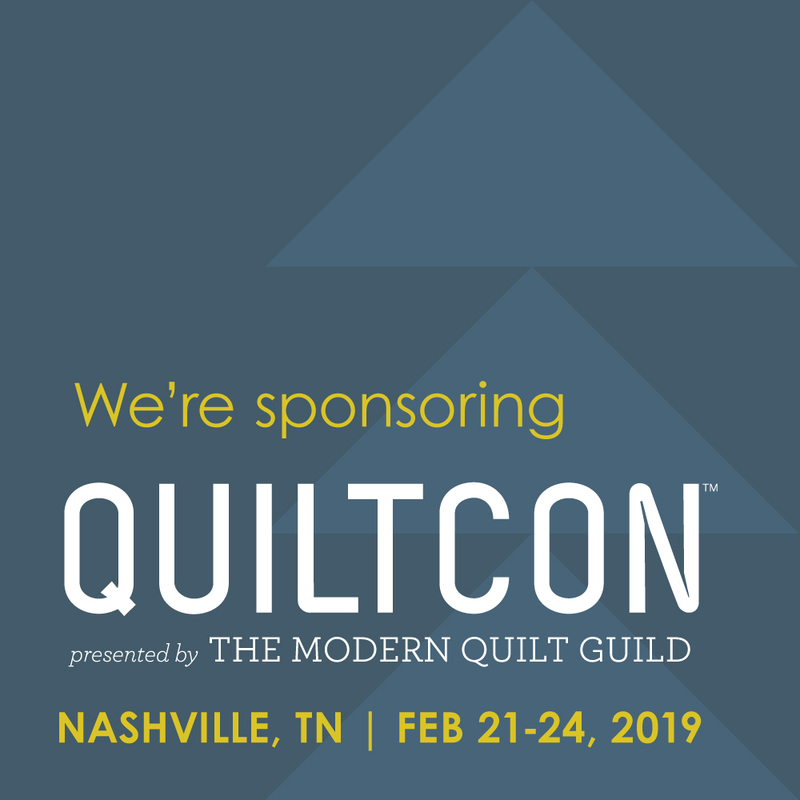 In addition to sharing some of the quilts from my first book at this year’s show, I taught an enthusiastic bunch of machine quilters and had such a great time! I love blue that tends more towards teal. It reminds me of cool tropical seas on a hot summer’s day! I also love to create what I call “controlled improv” with a variety of fabrics. This allows me to go a little wild and free with improvisational piecing while at the same time, containing the chaos. The fabrics were literally pulled from my scrap bin. I’m currently making a quilt for a magazine publication using many of these fabrics and it was so fun to go through my leftover scraps to see which ones worked for this block. I hope that everyone enjoys making my Improv Star block as much as I did! Right handed or left handed. and can you use the other at all? – I’m a righty – but I’ve taught myself to rotary cut left-handed so I can demo cutting for all of my students. What is your Favorite childhood TV show? I loved the Smurfs cartoon as a child. I always wanted to be Smurfette! Are you a Dog or Cat person? (or maybe something else?) – I’m not into pets – three children are enough for me! The Color you have always LOVED.….It’s changed over time, but currently I’m loving the stark graphic combo of black and white, with a pop of color. I have 2 blocks done, yeah! See my block 3 and how I auditioned. Plus my site is where you enter YOUR block to win a box of my thread next month! i click on download Christa BOM but it won’t download it, any ideas??? Make sure you have the latest version your PDF reader software, and try saving it first. It may automatically go to your downloads folder. Could you send me the pdf please? Query re: Aurifil “favorite” colors of Christa Watson in this story. I have current Aurifil thread chart. I wonder if you have typos in story? The only color resembling what Christa calls “Aluminium is number 2615, not 2516. Simple typo maybe? The color number she refers to as “very dark grey” (4241) is actually the darkest brown in the brown range on my chart. I don’t see any darker grey than # 2630, which doesn’t really look like the thread you pictured in the story, either. Could you please clarify these two Aurifil colors? Thanks very much. Katie S.
You are right – Aluminium is 2615 – that’s a typo. The very dark grey is also referred to as very dark brown but according to the official Aurifil color names it’s very dark grey. Hope that helps! I love Christa’s work and after making one of the blocks above, I decided I wanted to make more. Today, I made 2 more and I plan on making a baby quilt out of it! Thanks to you and to Christa! Love the block this month. I have enjoyed Christa’s blog for quite awhile now. Thanks so much for the interesting post. Love your improv block. Plan to make a bunch for a quilt with scraps. I have started using Aurifil thread for my quilting and really like it. Ѵеry good աrite-up. ӏ absolutely love thuis website. Thanks for these tips. One thing I should also believe is that often credit cards offering a 0 interest rate often appeal to consumers in zero rate of interest, instant endorsement and easy internet balance transfers, but beware of the number one factor that will void your own 0 easy street annual percentage rate and to throw you out into the very poor house quickly.